The legendary Diamond Chase Draw-Bar frame has been an industry standard for decades. It is undoubtedly the most precise self-stretching re-tensionable screen frame on the market, designed for the closest tolerance and tightest registration applications. Mesh tension can be adjusted on each frame side with bolts spaced every six inches (custom spacing also available). By far the best frame on the market for graphic printing. 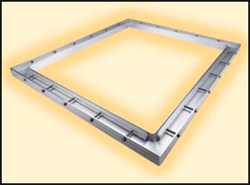 The Draw-Bar Frame system is a U-shaped channel with an enclosed fabric locking bar that is drawn outward with numerous bolts to tension and adjust the screen printing fabric. The Draw-Bars are manufactured for maximum flexibility and strength to achieve perfect screen tensions throughout the image area. The ease of the locking systems allow for excellent fabric installation and alignment. The ability to adjust on-press mis-registration within the frame itself makes it the most accurate system available. Keystone – Single tapered nylon rod slides through end of Draw-Bar, recommended for wire mesh and frames with narrow profiles because of its pre-tensioning ability. Top Loading – 2 round rods are snapped into the top of the Draw-Bar with the assistance of a wheel insertion tool, allowing the fabric to be secured simply and evenly. Available in 3 color coded sizes to accomodate all mesh counts.